The idea of integrating baseball began as a dream in the mind of Branch Rickey. In 1947, as president and general manager of the Brooklyn Dodgers, he defied racism on and off the field to bring Jackie Robinson into the major leagues, changing the sport and the nation forever. Rickey's is the classic American tale of a poor boy from Ohio whose deep-seated faith and dogged work ethic took him to the pinnacle of success, earning him a place in the Hall of Fame and in history. Bestselling author and Pulitzer Prize-winning reporter Jimmy Breslin is a legend in his own right. 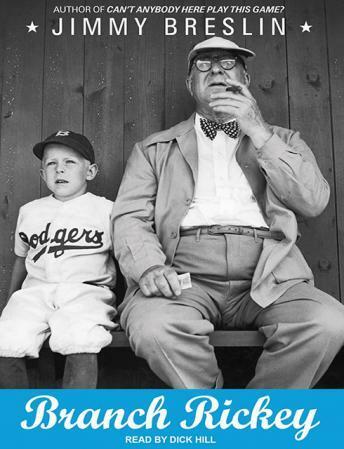 In his inimitable anecdotal style, he provides a lively portrait of Rickey and his times, including such colorful characters as Dodgers' owner George V. McLaughlin (dubbed 'George the Fifth' for his love of Scotch); diamond greats Leo Durocher, George Sisler, and Dizzy Dean; and Robinson himself, a man whose remarkable talent was equaled only by his resilience in the face of intolerance. Breslin brings to life the heady days when baseball emerged as the national pastime in this inspiring biography of a great American who remade a sport-and dreamed of remaking a country.